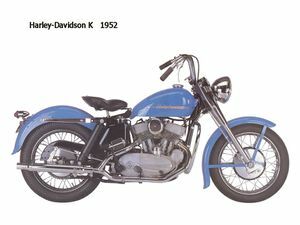 Harley debuted the Model K in 1952—a sporting motorcycle using a 45-cubic-inch (750cc) side-valve V-twin that had more in common with the pre-war era than the 1950s. It was introduced to replace the aging WL, and featured a good many "firsts" for Harley. Not counting the small S-125, which was actually a DKW of Germany design, the K introduced unit construction and was the first of its street machines to feature rear suspension. A race version of the bike won Daytona in 1953, but the streetbike was down on power compared to the 500cc OHV British bikes of the day. In 1954 the K series was upgraded to become the KH series.